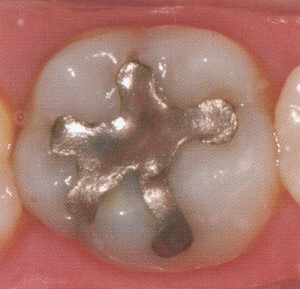 'Silver' fillings are made of amalgam - a mixture of mercury with other metals, such as silver, tin and copper. Amalgam is soft at first, but quickly becomes very hard once placed in the tooth. polish the filling at the next visit, when it is completely hard. If decay is left unchecked, it can spread into the tooth, causing pain and infection. This could mean the tooth has to be root filled or even taken out. A filling can end toothache or prevent toothache developing. Silver fillings are very strong, so they are ideal for back teeth, where there is heavy wear from chewing. They do, however; have the cosmetic drawback of turning black over time. White filling materials are also available, but the NHS will not currently pay for them to be placed on biting surfaces. This is because white fillings are less durable than silver fillings under the wear and tear of chewing.